Open source software for clothing pattern generation. Valentina is on the move, first of all with a new web design, for which they are looking for help with various aspects. More importantly, they have a twelve-month plan to use 3D modeling techniques to create custom designs based on a precise 3D model of any individual to be able to feed that information to Valentina for pattern generation. Presentation by Myriam Cea (Gráfica Liebre) and Beatriz F Estévez. A prosaic presentation of a philosophical approach to design by this group, who use free and open source software for their work. Here we had a description of computer analysis of images or image data in a way which humans might find useful, or medical image analysis, display of complex data of other types, or enhancement of images for a particular purpose. We were shown computer graphic analysis from a computer’s point of view, where images can be analyzed into various elements, then those elements separated, collated, manipulated in various ways, at least some of which are interesting, and others perhaps you are puzzled by the computer’s analysis. Julien is on a mission to find a Git Hub-like alternative to assist designers in archiving their work and its various iterations. Thus far he hasn’t succeeded, but he remains hopeful for finding the right platform which would be usable by designers in a more visual way, in addition to keeping an archive of their work, and sharing with others. The talk explained the shortcomings of various alternatives out there. This was a description and video demo about a device Roman and Jérémie Cortial have been working on. It’s a combination of bespoke hardware, running some open libraries, to allow drawing on paper with colored markers, which are then digitized and represented digitally. The specific use they have mostly been working with is to create interactively a digital pinball machine, with as many reiterations of design-play-redesign-play as you would like. Although they have not pursued this in other directions, the libraries are open source and might be used for other ideas. We’re slowly gathering here at Westminster University. An amazing space to work, meet, discuss and hang out, welcome! 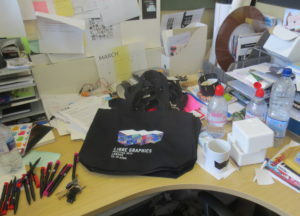 The exhibition looks wonderful and merchandising (here still piled up in Larisa’s office) will be exciting too. So, see you here soon? …or via download here! + .ics program too: here! This year we are excited to announce that we will be hosting an exhibition, running alongside the meeting itself, that showcases the work of processes and outputs from long-standing members of the Libre Graphics community as well as new contributors who responded to this year’s call for participation on the theme of ‘Other Dimensions’. One week to go! As we are finalising all preparations, we would like to draw your attention to our Code of Conduct (CoC) which is trilingual this year! Please take time to check it out. Info on CoC champions and their contact numbers will be published shortly.